Bonsu is earning a degree from the Nursing School’s Clinical Nurse Leader master’s program, a fast-track to nursing program for non-nurses entering the profession. Initially, cake-making posed a personal challenge. Not a life-long baker, Bonsu admits it didn’t come naturally. “Missy’s Cakes” grew out of her stubborn pursuit of the perfect cake, some pent-up creative energy and a love of sweets. After digesting dozens of YouTube videos, Bonsu launched her one-woman business last winter after refining her recipe base and declaring a couple of caveats. Only real buttercream frosting. Only assignments she can handle alongside her studies. And no fondant, except as a flourish. Today, that means she bakes between two and three specialty cakes each week, out of her diminutive Woodbridge kitchen. And so far, there’s no shortage of work. She’s tackled birthday cakes, retirement cakes, baby shower cakes and anniversary cakes. Of the 10 to 12 weekly order requests she receives, she says yes to just a few. 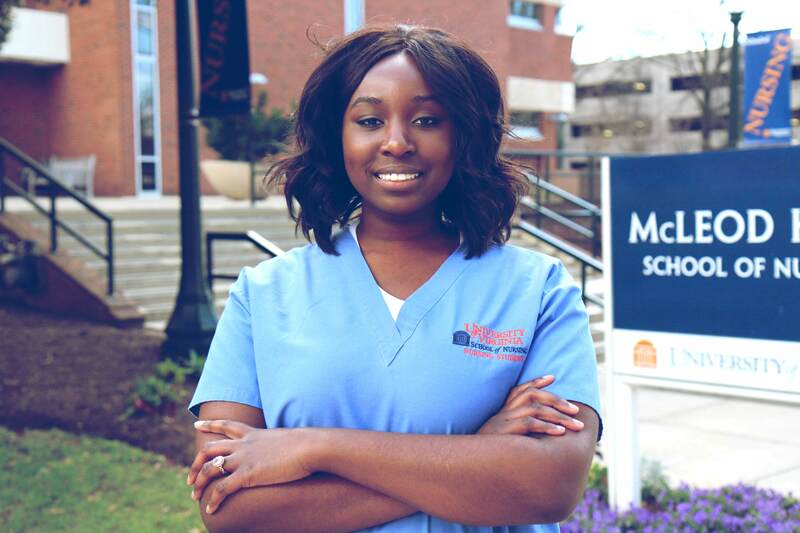 And even with a job lined up as a labor and delivery nurse in a Fairfax hospital after graduation, Bonsu has no plans to scrap the baking business because she still finds great relief in the recipes. “Sometimes, I start at 7 p.m., working through the night,” she explains. “I look up, then, and it’s 5 a.m., and I’ve been completely lost in baking. I can focus completely on it, put all my energy into it, and get all that creative energy out. It’s also something I can do that’s not nursing, and there’s great relief in that. “People always ask me, ‘Did you do this before?’” she said. “It wasn’t until I began nursing school that it became an outlet. But in my head, it makes sense, because in nursing, you just have to throw yourself in there and do it” while also finding ways to keep your own spirit buoyant. Her UVA peers have not only been taste-testers, they’ve been her champions. That warmth and camaraderie, says Bonsu, is what she’ll most remember about her time at UVA.